News: The Resource Centre in Sturminster Newton Museum closed in autumn 2015. It re-opened in a dedicated space in our new shop "Safe Journey Home", at 7 Market Cross in Stur, in November 2015. The information below describes the Resource Centre when it was in the Museum - we will update this shortly. Please come and meet us in "Safe Journey Home". Organiser, Manager and Founding Trustee of TMIT; Director of The Art of Living and Dying Project; funeral and end-of-life advisor; teacher; former trustee for NDC (Natural Death Centre); Fellow of the Society of Bereavement Practitioners. "Safe Journey": the name conjures up thoughts of holidays or journeys home after a long day and in this case the journey refers to the journey through life into death. The journey is an inevitable one, yet many of us have questions or concerns about it, and it can be hard to know where to look for information. 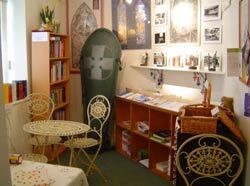 Why not pop into the Resource and Drop-in Centre, housed in a cosy little room at the Museum. Here you’ll find biodegradable, eco-friendly coffins, details of natural burial grounds, and impartial information and support for the whole ‘journey’, from putting your affairs in order and finding a companion to be with you and/or your loved ones as you are dying, to funeral and bereavement support. Here you'll find hope: an ear to hear, a heart to care. T here are small items and books to buy to support the work of The Martinsey Isle Trust, of which The Art of Living and Dying Project is a part. We are also building up a resource for those working in death, dying and bereavement. 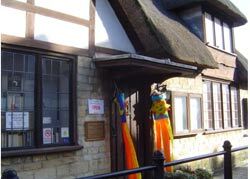 At present the Centre is open on Thursday mornings from 10.30 am to 12.30 pm (or at almost any other time by arrangement with Judith). To book an appointment for "Planning my End of Life and Funeral Care", please contact Judith, and she will get back to you as soon as possible. NB. We are not offering a counselling service. Judith began the Resource and Drop-in Centre in 2004 in her garage and cottage where she had gathered information and coffins and created a safe place to talk. People called, emailed, telephoned and wrote - there was a real need. If you too would like to create something similar with links to the TMIT,please contact Judith. We hope this is the first of many Resource Centres throughout the land. The Trust wishes to acknowledge the inspiration of Josefine Speyer and Nicholas Albery who began the Natural Death Centre in their home. Many people are afraid to talk about death until inescapably confronted with it - and then it can be too late. Did we give her a good send-off? Was it what she would have wanted? She's in a vegetative state. Could we have done more? What a lovely space for such a loving subject. Welcoming and interesting. I hope many people come through your door to find out more. This is a wonderful centre either before or after death. Everybody feels so helpless in the face of something none of us really understand. We all need to be informed and helped. A wonderful place of kindness and serenity. A small space filled with beautiful items and bursting with useful information. Great idea—well worth popping in. So many different options that I didn’t know about beforehand. A wonderful inspiration makes me very uplifted and a great pleasure to talk to Judith. I now know what I want at the end of my life for my funeral. It has been such a relief to talk this over with Judith and we had such a laugh too - and a few tears. My daughter knows now. We've talked about it a lot since, and now we can get on with our lives. Some of my fear about death has gone. They are so kind there and they give you as much time as you need every time you go. We're all sorted out! Not just what I thought I was going for! TMIT's body psychotherapist specialising in bereavement; TMIT psychotherapy lead and volunteer; previously trustee for NDC; Fellow of the Society of Bereavement Practitioners. Pastoral care. C of E priest in retirement (but willing to help people of any/no faith). Former teacher. Sympathetic listener to the lonely, the ill, the dying and the bereaved.